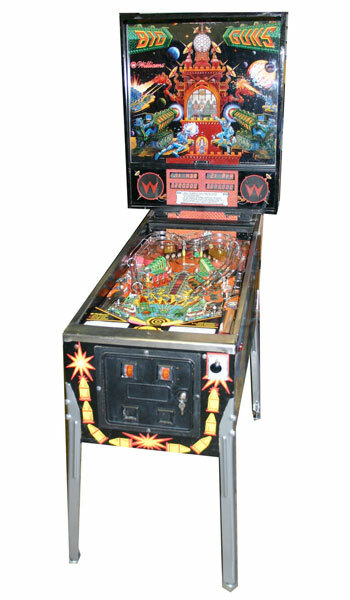 Check out these 1987 Williams Big Guns Pinball Machines for sale. You will also find parts and accessories including the LED kit, Ramps, Pop Bumpers, Speaker Upgrade, Flyer, Sound Board, Flipper Rebuild Kit, Fuse Kit, CPU Rom Chip Set, Translite, Playfield Plastics, Target Set, Mods, and Custom Target Decals. Crazy criss-cross design with shots going in all directions. Upper flippers are utilized with timers quite nicely. The theme is executed well, and the feeling of going to war is communicated with the same urgency as my enlarged prostate! Check the listings below for available machines.